A simple notion of parenting is to tend to your child’s immediate needs, to teach right from wrong and to make certain they develop into well-adjusted individuals. But why is it so difficult in public? The main reason is it that we have to parent in front of an audience. With the added difficulty of having an extremely picky, judgmental and subjective crowd. Think crying baby on an airplane. The difficulty stems from being under severe scrutiny and not wanting to be viewed as a bad parent. We want to be seen as the parents we appear to be on Facebook. Oftentimes, parents are more lenient and less strict to their children in public. It’s not uncommon for parents to give in to their toddler’s demands to avoid a tantrum in front of a public audience. The challenge in having two approaches creates a lack of consistency or continuity and as a result, children will quickly learn and take advantage of this opportunity. Some parents may go along with their child’s behavior and leave the consequences for when they get home, while others will completely forget. Only a few brave parents will choose to parent on. To be successful at parenting, you need to be consistent and have a balance between rewards and consequences. It does not matter where you are, the supermarket, playground, or a party, do not be embarrassed or afraid TO PARENT. The first and most critical step is to take a moment and let your child come down and to regain some semblance of composure. Next, acknowledge your child’s feelings and set similar boundaries to those at home. The final step is a creative finale. This is when you as the parent provides a resolution tailored to the specific needs of your child. For example, your child wants a toy in a supermarket, or anything for that matter. He ends up on the floor crying when you say no (true story). When your child has a meltdown in public, don’t brush it off and give in just to stop their crying immediately and to eliminate any potential public embarrassment. Use this as an opportunity to set boundaries in the real world. If you give in once, your child will have a tantrum next time, because now he knows how to get what he wants. They are quick learners. First of all, let your child to get it out and cool down. Do not give in or focus your attention to your child, because this “show” is initially just for you. You’ve probably heard this before, but children are incredibly smart and very observant. They realize early on that parents do not like to be embarrassed in public, so they cry to get your initial reaction. However, in public they are able to get attention and a reaction not just from you but also from everyone else around them. So, here comes an Oscar moment for your child, at the peak of a solo performance and you as a parent, having a difficult discussion with one self, to be or not to be that parent who gives in just one last time, to stop that embarrassment? The answer is easy. Don’t give in, stay strong! Continue with your shopping without giving your child the attention and reaction he is looking for, do not make eye contact or acknowledging your child by actively ignoring him. The use of active ignoring can quickly stop unwanted behaviors such as talking back, mild arguing, whining, or doing things to get your attention. Before you start using this technique, explain to your child that when problematic behaviors start, you will not give your child any attention. Try not to look upset but instead try to keep busy with something. As soon as the unwanted behavior stops, you should pay attention to your child right away. Expressing interest in your child is important by making eye contact and talking to him. If the unwanted behavior starts again, you can revert to the ignoring technique again. It is important to be consistent, even if things get worse at first. When your child can’t get your attention, he might not give up right away, and try even harder. This is normal and it’s a sign that active ignoring is working correctly and it’s starting to have an effect on your child. Just to make sure that your child is safe and isn’t harming himself or others. Another scenario of parenting in public can take place at a party. As expected, you might be surrounded by fellow parents who, just like you, are hoping and praying that the whinny little brat will not be their child this time and they may be able to proudly present their calm and well behaved offspring to the society. But even well-behaved children can sometimes act out. So, being a parent of “THAT” child can happen to the best of us at the most unexpected time and place. For example, you are at a birthday party and your toddler throws a piece of cake on the floor (true story). He is surrounded by his friends and he wants to be “the cool kid” or possibly because you were talking to another mom and did not give him enough attention or he is simply pushing boundaries. First and foremost, you need to stop the behavior. Immediately, ask him to stop, but most likely he’ll continue with a mischievous smile on his face knowing that you probably won’t escalate the severity of consequences in front of an audience. In this case, counting works well specifically with younger children. Make certain to set expectations by letting your child know that you will be counting to 3 and if he does not stop, you will all go home immediately. You need to be serious about the consequence. The whole idea with counting is that you do not reach 3. Your child probably does not want to miss out on the party and a party favor, so he should stop. If he doesn’t you may need to pack up, take your child and head to the car – whatever it takes to show that you are 100% serious. Once the behavior subsides and your child agrees, what is there for you to do? Pick up that cake and pretend that nothing happened or sternly speak to your child for misbehaving? Neither. You need to keep calm and parent on. It can be difficult but it’s not impossible. 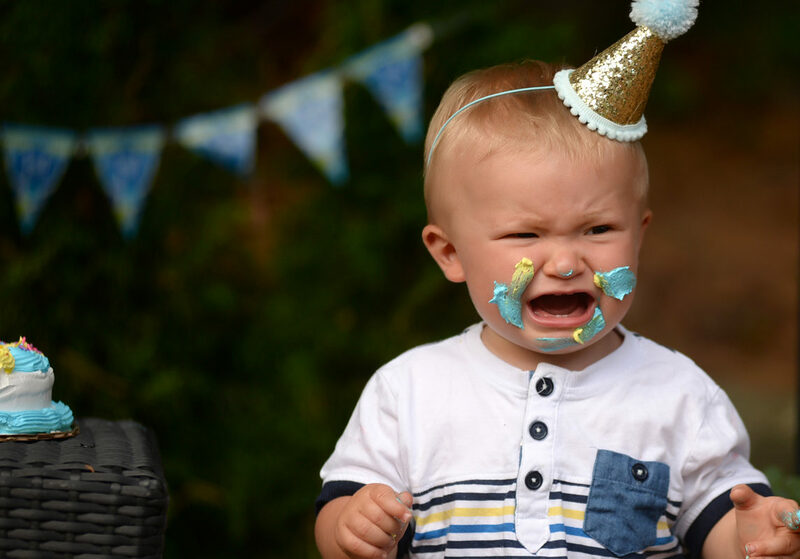 You may be embarrassed, contemplating of the next birthday party, play date or the next visit to the restaurant and how you will handle your child then. Parenting is difficult and you are not a bad parent, no matter how many eyes are upon you. As mentioned earlier, even well-adjusted children have their moments. When providing effective instructions to children, it is important to be direct, clear and succinct. In our case, instead of saying, “let’s clean up this mess” or “we should clean this up” you would say “please pick up the cake off the floor.” This clarifies the exact action and sets expectations for what is being asked. Avoid “let’s” or “we” instructions and ones that end with a question. They may be misinterpreted and open you up to the possibility for further arguing and discussion. It is also helpful to have your child repeat the instruction back to ensure that he understood the request. If your child listened and cleaned up, give very specific praise by highlighting that he listened, and did what you asked. This is a critical step to reinforcing positive behavior. Parents often are quick to notice and give attention to negative behaviors while downplaying positive ones. Children want to please parents and if positive behaviors are highlighted, they may be more motivated to pursue attention via positive behaviors. Remember that parenting in public should not be avoided but should be used as a teaching moment for you and your child. Now that you know what to expect from your child and how to react, you can use this knowledge and try to prevent certain behaviors in the future. When going out, make certain to set expectations and ground rules for behavior. The traditional ones, such as no fighting or bullying, sharing and being polite are a great place to start. Make sure to expand on these based on the specific scenario and tailoring them to your child and your knowledge of their behaviors.